Honor Your Health with Gentle Nutrition. Although intuitive eating promotes somewhat of an “eat what you want” mentality, it’s still important to care about good nutrition and make choices that will make you feel best. Intuitive eating creates a mental space and a positive relationship with food that allows you to adopt health-promoting habits rooted in self-care, making it much more sustainable and enjoyable than rigid diet rules. The difference between intuitive eating and traditional diet approaches regarding nutrition is that, here, nutrition is the very last principle. It comes last. Healing your relationship with food, your body, and ditching the diet mentality come first so that you’re able to consider nutrition choices from a place of self-care and not restriction. This principle does not mean that you will eat a “perfect” diet by any means, nor that perfection is required to be healthy. It’s not. It simply means that intuitive eating should still involve more fruits and vegetables than desserts, but that those desserts can be part of a healthy diet too. NOTE: Early on in your journey, you might eat more “bad” foods, the things you had previously deemed as “off-limits”, until your body trusts that you’re able to eat those things freely when you want them. Intuitive eating encourages “gentle nutrition” for you to make choices that are both good for your health and satisfying for your taste buds. It’s not rigid, restrictive, or complicated. A single food, meal, or day of eating makes very little difference when it comes to health. Think about patterns rather than single situations. Small shifts in your pattern of eating will make a much bigger difference than a single meal or day of eating “good” or “bad” will. And, if you do eat something “unhealthy” one day that might be out of your typical eating pattern, it’s okay. The worst thing you can do is dwell on it and try to compensate. That food will make such a minute difference, if any at all, so just listen to what your body is asking for, honor it, and move on. Rather than trying to determine things you believe you should eliminate from your diet, look for things to add that would help boost your nutrient intake. All foods DO fit, but there’s no denying that some foods are more nutrient-dense than others. Can you include more leafy greens by throwing spinach in your morning smoothie or scrambling some into your eggs? Can you try eating fatty fish more frequently? Experiment with a can of tuna or keep some frozen salmon in the freezer. Can you switch your bread from white to whole grain or try brown rice instead of white rice sometimes? By eating many different foods, you’re able to get a much wider spectrum of vitamins and nutrients. This goes not just for fruits and vegetables, but other sources of carbohydrates, fat, and protein as well. 4. Pay attention to how foods make you feel. Certain foods may help you to feel more energized than others, or some foods may not sit well in your stomach. Maybe a big breakfast helps you to stay focused and energized through the morning, or maybe eating too much in the morning makes you feel a bit icky. Find what works for you, and incorporate those findings into your decisions. 5. Try cooking at home more often. 6. Listen to your hunger and fullness cues. These cues were discussed greatly in principles #2 and #5. By listening to your body, you can be sure that you’re getting the “right” amount of food. Read the previous principles for more information about this one! 7. Create an environment that you can easily make health-promoting choices. Things such as keeping fresh fruit on the counter, having snacks prepared when you’re out and about, or keeping a pair of tennis shoes in your car can make it easier to choose a “healthier” option when you’re up to it. Nutrition and healthy eating IS a part of health, but it’s only one part. Your mental health, social life, sleep quality, stress levels, and more are also part of it. If doing something to try and improve your nutrition negatively affects one of these other areas, then it’s not actually a healthy choice. By applying the first nine principles of intuitive eating, this last step should start to come naturally. Stay focused on progress, not perfection, and allow gentle nutrition to help you pursue health in a way that does not make you feel as if your value as a person depends on it. Everything in moderation. All foods fit. I really hope you enjoyed this series, and if you missed any of the principles, please go back and read them! If you’re ready to start your intuitive eating journey, or maybe you’ve already started and are feeling a bit lost, I’m here to help. I want to help you. Message me HERE or fill out THIS INQUIRY and we’ll be in touch soon! Exercise – Feel the Difference. 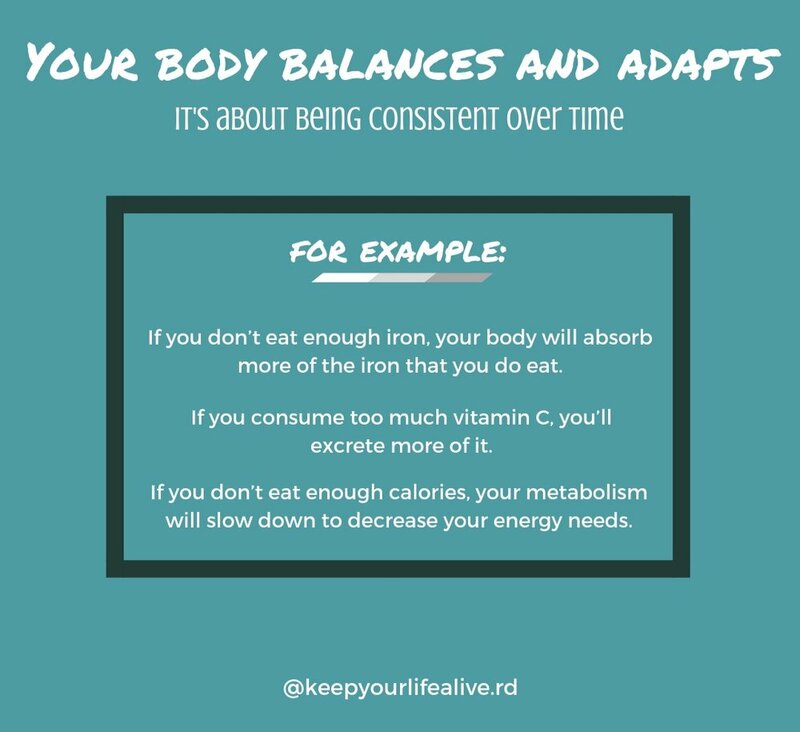 Exercise is part of a healthy lifestyle, but the focus needs to be on the difference you feel in your body rather than the calorie burning effect. When exercise is something you HAVE to do, you’re much less likely to WANT to do it. However, moving your body in a way that is sustainable and enjoyable will allow you to experience the benefits that will keep your coming back. When exercise is decoupled from weight loss and not seen as a “chore”, it becomes joyful. It’s actually a form of respecting your body, because our bodies like to move. Just get active and feel the difference. Mindful exercise can help you to feel more confident in your body, too. Is your attitude “i have to” or “i get to”? However, intuitive eating does not mean you need to go to the gym every day or even workout every day. You still need to listen to your body when you really don’t feel like moving—that’s allowed. You don’t have to earn rest. Sometimes the best thing you can do for your health is to sleep or sit on the couch. Your body knows what it needs, so listen. Don’t fall into the “it’s not worth it” trap either. You don’t have to sweat to have a “good” workout or be in the gym for an hour for your workout to “count”. Little activities add up! Simply MOVING for 30 minutes most days of the week (and it can be split up—such as moving for 10 minutes 3 times) reduces your risk of heart disease by half! Focus on how you feel and tune into the things you and your body enjoy. See below for a list of some different ways to get active, and if you don’t like something, try something else! Always remember to replenish your glycogen stores too, AKA eat your carbs! In the Intuitive Eating book, we’re shown that proper carbohydrate replenishment after a 2-mile run is the equivalent of 3 slices of bread. For a 6-mile run, 10-11 pieces of bread! We can’t move joyfully, or much at all, if we don’t have proper amounts of fuel and energy, and our bodies can’t repair themselves after intense movement without enough nourishment. Stay tuned for the final principle! I don’t mean in the same way as I’ve discussed in the previous principles—such as eating when you’re hungry or stopping when you’re full. This principle goes a little deeper than that. Feeling good in the body you were genetically meant to have is required to be able to reject the diet mentality and honor your needs. We’re not all meant to have the same body, and yours is worthy of respect just as it is, in this very moment. Body respect isn’t the same thing as “body love” or “self love” either. You don’t have to love every single part of your body in order to start respecting it, but if you don’t believe that your body is worthy of respect now, it doesn’t matter how much you try to (successfully or unsuccessfully) change it… you never will. Respecting your body means treating it with dignity and meeting its needs. It’s difficult to respect your body when you’re constantly bashing yourself or your looks with unrealistic ideals or expectations. Instead of thoughts that bring you down, stop and replace them with positive or respectful statements. Accept what you’ve been given and feel confident about who you are. Research has proven that we each have a certain “set point” weight at which is our body is genetically programmed to fall. Trying to force yourself into a smaller or bigger body than you’re meant to have is like trying to squeeze into a pair of shoes that’s three sizes too small; it’s uncomfortable and ineffective. When you are truly listening to your hunger and fullness cues and eating the foods that you crave, your body will find its set point all by itself… really! It wants to be at that weight no matter what you’re doing. Respect your body, and you will feel better about who you are. Your body is unique, but your personality, relationships, and values are so much more important than your physical appearance. Stay tuned for principle 9! Cope with your emotions without using food. Food will not fix feelings of anxiety, stress, boredom, or other negative emotions. Instead of eating as way to numb, distract or comfort, we must find ways to resolve these issues without food using healthy coping mechanisms. The food might provide short-term comfort, distraction, or numbing, but it won’t solve any problems. Also, people often overeat as a way of distracting themselves from these kinds of feelings, and instead of now just dealing with the source of the emotion, the individual must deal with the discomfort of overeating as well. Being more mindful– of both food and emotions– can help you to identify triggers and find healthy ways to cope when negative feelings arise. You can do this by learning to sit with your feelings… which is much easier said than done. Learning to pause and take the time to identify your emotional triggers can help you to connect your eating with hunger and satisfaction rather than your feelings. Even if you ultimately decide to eat even though you’re not really hungry, taking a minute to think about this question still makes it a more mindful eating experience. Is eating going to satisfy you? It may, you might be hungry. Then you should eat. But conversely, are you turning to food to fill a different need? Are you just bored, frustrated, stressed, anxious, depressed, looking to fit in, or using it as a means of control? If you need nurturance, you might take a bath or do yoga. If you need to distract yourself for a little bit, you might watch a movie or read a book. Maybe you just need to cry. See below for a list of coping strategies. Eating for emotional reasons CAN be totally normal and okay. Food is often used to celebrate or soothe or connect, and there is nothing wrong with having some emotional attachment to it. It becomes a problem when food is your only way of coping with emotions and drives you to behaviors that may have negative consequences—things like binging and feeling guilty or avoiding certain feelings and situations. Having ways to cope with feelings that don’t involve food keeps food from becoming the most important thing in your life, as well as keeping it from being something you stress about, feel guilty about, or feel the need to control. If you do choose to eat when food is not what you’re really needing in that moment, that’s okay. Allow yourself to do so without judgment, and move on. If you’re taking that time to pause and ask yourself what you’re feeling, you’re still making progress. As you practice, you’ll be able to sit with your feelings longer, and your need to turn to food at unnecessary times will diminish. Be gentle. Have patience. Stay tuned for the next principle! Principle #6 of Intuitive Eating sort of goes along with the last principle of Feel Your Fullness. But… fullness and satisfaction are not necessarily the same thing. You can be physically full, but if you’re not satisfied, you’ll still be thinking about food. You’ll still need something to fulfill the craving or desire you have. In short, your body isn’t dumb. If you try to fulfill a craving for ice cream with frozen fruit, you’ll keep going back for more in an attempt to fill that unsatisfied void. If your meal is missing a macronutrient (carbs, protein, or fat), you’ll likely not be satisfied until you finish that missing component. The entire eating experience—eating the food that you want, appreciating the taste and texture, and being in a pleasing environment—should bring pleasure. Understanding what feels good and what doesn’t is the key to feeling satisfied and being able to move on after a meal. Ask yourself what you REALLY want to eat. And then, give yourself unconditional permission to eat it. Be willing to try new things, and don’t allow yourself to have any foods that are “off-limits”. Pay attention to the sensual qualities of food. What food aroma might appeal to me? How will the food taste and feel in my mouth? Do I want something sweet, salty, sour, or bitter? Do I want something crunchy, smooth, creamy, soft, fluid, etc.? Do I want something hot, cold, or moderate? Do I want something light, airy, heavy, filling, or in-between? Make your eating experience more enjoyable. Also, eat in a calm environment without distractions. Distracted eating makes it more difficult to be in tune with your body and find pleasure in eating. Sit down and enjoy your meal, with another person if you can, rather than standing in front of the fridge or scarfing down some food. You’re not obligated to finish food you started eating. As it’s put in Intuitive Eating, “If you don’t love it, don’t eat it, and if you love it, savor it.” However, that does not mean to just not eat. Find something else, order a different dish… be sure that you still feel satisfied when you’re finished. Check-in throughout the meal to see if the food still tastes good. The closer you get to reaching fullness and satisfaction, the less appealing food will be. I mentioned that fullness and satisfaction are not the same thing, so let me explain a little bit. Satisfaction makes it much easier for you to stop eating when you reach comfortable fullness. They both play a role in regulating when you decide you’ve had enough to eat, but you can feel full without feeling satisfied, and you’ll continue looking for food to eat. Think of fullness as being a physical sensation, while satisfaction is more of a mental feeling. Satisfaction is actually a better indicator for deciding when your body is ready to stop eating; it’s a very powerful regulator. When we deny ourselves what our body really wants, we end up eating more and enjoying it less. You’re craving ice cream. Real, dairy ice cream. Instead of honoring that craving, you tell yourself that ice cream is “bad”, “off-limits”, and there’s no way you’re going to eat it. To try and trick yourself, you decide to make some “nice cream” (AKA frozen bananas blended up). You eat it, but guess what. You’re still not satisfied. Your body knows you didn’t eat ice cream. You had that craving for a reason. Your body needs a certain nutrient, and since you tried to fulfill it with a substitute, you’re still thinking about food. Ice cream, specifically, whether you want to be or not. You go for another “healthier” substitute… maybe some popcorn. You’re still not satisfied, and you won’t be until you eat what your body is asking for. If you would have had a scoop or two of ice cream first, you most likely would have ended up eating far less food yet feeling much more satisfied. When you let yourself eat what you want, the pleasure that you feel helps you to decide that you’ve had “enough” much sooner than if you had chosen to eat something you though was “good” or that you’re “supposed” to eat. Eating should bring pleasure and satisfaction. Think about how the food is making you feel, not how you are feeling about the food. When we eat what we truly want and eat enough to be full, our bodies can trust us and we can trust them to lead us to the right foods and the right amounts. Especially if you’ve been a chronic dieter or have struggled with disordered eating habits, it may be difficult to find what foods are most satisfying to you. As with the whole intuitive eating journey, be gentle with yourself, keep practicing, and have grace. It will get easier the more you honor your body, and you’ll begin to feel more confident in yourself and your choices. And with that, stay tuned for the next principle! Not only is it important to honor your hunger (read about that in principle #3! ), but we also must listen for the signs that our body is no longer hungry. Honoring hunger and respecting fullness are different sides of the same coin; they both involve eating mindfully and trusting your body. If you aren’t honoring your hunger and are forcing yourself into a ravenous state, your chances of overeating when you do get around to a meal are very likely. The same way that our body sends hunger cues when it needs food, we can observe signs of being comfortably full, too. Practice conscious eating to find comfortable satiety. Ways to do this? Read on. 1. Tune in while you eat. I know I’m extremely guilty of eating while I’m working, watching TV, or scrolling through Instagram. Getting rid of these distractions allows you to truly enjoy your meal, savoring the flavor and aroma, chewing each bite thoroughly. SO SLOW DOWN. Being tuned in also means paying attention to how hungry you are at the start of a meal and when your body hits the point of fullness and satisfaction. Does this food still taste good? Is it still pleasurable? What is my current fullness level? 3. Don’t feel obligated to leave food on your plate. Sometimes you’ll reach fullness and satisfaction before the food on your plate is gone. Don’t feel the need to stuff the rest of the food down if your body doesn’t need it. As long as you allow yourself to eat again when hunger hits, your body will appreciate you stopping at a level of comfortable fullness. It’s not uncommon for past dieters to feel they must “clean their plate”, having experienced some sort of food scarcity in the past. Because they’ve felt deprived, there is a need to finish food at any given chance. On the other hand, though, if you finish the food on your plate and still aren’t satisfied, honor that too, and find something to satisfy your remaining hunger. It’s not an absence of willpower to finish your food or even grab something extra after. In answering the question “What is my current fullness level?”, it’s helpful to use a scale like the one below. The hungrier you are when you start eating, the higher your fullness number is likely to be when you stop. Beginning to eat when you hit a 3 or a 4 gives you more likely of a chance to stop when you hit 6 or 7—satisfied, but not overfull. When you’ve finished your meal, assess your fullness level again with the scale. Are you comfortably full? Uncomfortably full? Satisfied? Still hungry? Comfortable fullness typically stands around a 6 or a 7. You’re comfortably full, not overstuffed, and no longer hungry or thinking about food. We ALL have the power to listen to our bodies in this way, but many individuals have ignored these signs and signals for so long that they must intentionally work to get back in tune with them. IF THAT’S YOU: Working with a dietitian can help guide you back to successfully identifying hunger and fullness cues. Likewise, if you find yourself feeling out of control and consistently eating very large amounts of food and/or to a very uncomfortable state, seeing a professional can help. 1. Stop comparing your needs to somebody else’s. Every BODY has different needs, and those needs change each day depending on a number of factors such as physical activity, hormones, sleep, etc. We don’t all eat the same foods, the same amounts, or at the same times every day. Sometimes you’ll eat more than everybody around, sometimes people will eat more than you, and sometimes some people won’t eat anything at all. No matter what, your only responsibility is to listen to YOUR body and honor what it needs in that moment. Nobody else’s choices should directly influence yours. 2. Know that it’s okay to overeat sometimes; it happens. There are many reasons that we might overeat: holidays, vacation, a crazy schedule, an emotional time. It’s also very common to overeat after you’ve newly given yourself unconditional permission to eat what and when you want on your intuitive eating journey. Your body just has to learn to trust you again. Balance will come. The important thing is to not restrict in any way after you do overeat. This is just going to perpetuate the diet cycle. You might feel even more hungry than usual the next meal or the next day, you might feel less hungry. There’s no right or wrong answer, just respect what your body is telling you. 3. You have a right to say no. Often at social events, hosts may try and “push” food onto their guests. You can say no. You don’t have to eat just because somebody wants you too. If the food does sound good to you, though, please accept it and enjoy it. 4. You won’t always eat the same amount of food. How long it’s been since your last meal—if it’s been quite a few hours, you may need some extra fuel. What you’re actually eating—different carbohydrates, fiber content, protein, and fat all influence your fullness and satiety. 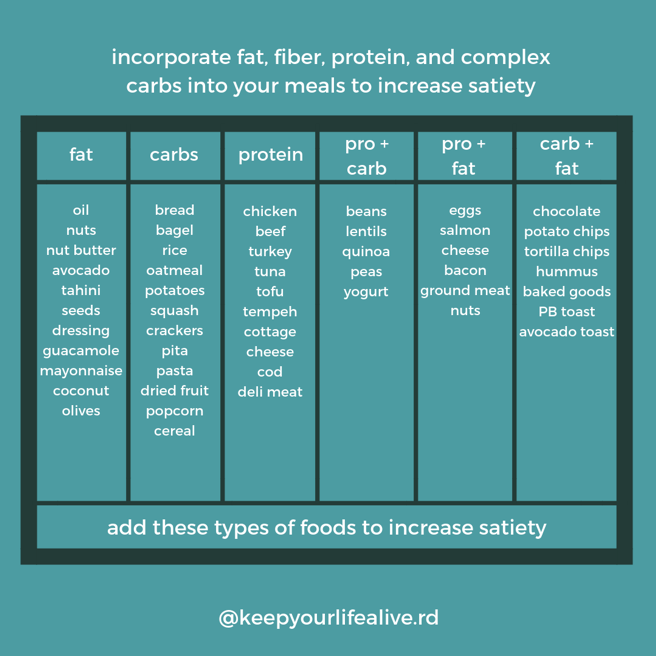 A key practice here is to incorporate a complex carbohydrate, source of protein, source of fat, and fiber into each meal (and ideally at least two different groups in a snack). Balanced meals will provide your body with the nutrients that it needs while increasing satiety. what if you’re afraid to eat to the point of fullness? This is the case in many individuals that have struggled with disordered eating habits. What I can tell you is this: going through life hungry is no way to live. You will continue to feel preoccupied with food, often irritable and with low energy. Eating until you are full and satisfied is the only way to build mutual trust with your body. If you’re consistently under-eating (maybe only eating to about a 5 on the hunger-fullness scale), restricting certain foods or setting them as “off-limits”, compulsively exercising, are underweight (or under YOUR body’s ideal weight)… you’re most likely going to experience skewed hunger and fullness cues. Often times individuals will also feel they’ve reached “fullness” but still can’t stop eating, or are “full” but not “satisfied”. I’ll talk more about these in the following principles, so stay tuned! Learning to feel your fullness takes practice, patience, and intention. There is no failing, and sometimes you are going to eat past fullness or while you’re distracted watching TV. That’s okay. This is about learning to connect with your body’s signals, not about being perfect. Get ready for principle #6! I hope you’re finding this Intuitive Eating series helpful. The “food police” are the voices in your head trying to make you feel guilty for eating “unnecessary” calories, having dessert, being hungry, or wanting a certain food. They scrutinize every eating action to keep you, food, and your body at war. The food police want you to follow the dieting rules you’ve been bombarded with for years, but you need to chase them away. Scream “NO” to these thoughts. You’re not “good” for eating minimal calories or resisting a craving. You’re not “bad” for eating a piece of cake. These are guilt-provoking lies, but the truth is that food and weight have nothing to do with morality. Accept that there is no morality tied to nourishing your body a certain way or for enjoying any kind of food. Your weight, shape and the way you eat are not, in any way, a reflection of your worth as a person. Friends and family that offer judgment or “advice” about what and how you’re eating are also “food police”, and it’s time to tell them no, too. Our entire culture has normalized and reinforces judgmental diet culture thinking, but when this turns into rigid rules and makes you feel negatively about yourself, they need to go. Banish the absolutes and replace them with permissive statements. Carefully listen for “absolute” words that you use: musts, oughts, should, need to’s, supposed to’s, and have to’s.These words and thoughts cause anxiety about not being able to carry out the command. Thinking in this way does not guarantee the behavior you desire, so they often create self-sabotaging behaviors and feelings of failure. Use permissive words such as can, is okay, and may. Replace the thought right then and there. -It’s okay if I don’t lose weight before XYZ. I don’t need to lose weight. -I can eat whenever I’m hungry. -I may have any foods that look or sound good to me. What are your food rules? Where did you first hear these messages, and how did they get reinforced? How do you feel when you “break” one of these rules, and how does it affect your eating behavior? Chase away the food police so that you can learn to eat intuitively again. It’s impossible to view eating as a normal, pleasurable activity when the food police are governing each and every food decision and unreasonable rule that dieting has created. Stay tuned for principle #5! To do this, all you need to do is give yourself unconditional permission to eat anything that your body wants. But I’ve got some tips for you and an exercise to help you begin moving towards this mindset of freedom. Giving yourself unconditional permission will allow you to retrain your brain to think about food in a morally neutral manner and to truly trust your body. Diets, or any kind of restrictive eating, often portray certain foods as “off limits” or label things as “good” or “bad”. When you aren’t allowed to have something, it becomes that much more tempting. Feelings of deprivation lead to uncontrollable cravings, often followed by a binge and intense guilt. And the cycle repeats. No matter what, we should not feel guilt or shame for eating. WE SHOULD NOT FEEL GUILT OR SHAME FOR EATING. Where is this rule coming from? Somewhere internally or from an external source? A place of control or compassion? What would letting go of this rule make possible? Now, I know what you’re probably thinking... If I give myself permission to eat ALL the foods ALL the time, I’ll never stop eating!! People often couple the idea of complete food freedom with overeating or overindulgence, but I assure you, it doesn’t work like that. Once your mind and your body know that you can have whatever you want, whenever you want, your cravings WILL diminish. When you begin to eat consistently and appropriately, your body is able to trust you and tell you when you’re hungry, what you’re hungry for, how much you need to eat, and how to feel satisfied. It’s what our bodies are biologically made to do. According to Evelyn Tribole and Elyse Resch, making peace with food means that a choice to eat chocolate is emotionally equal to a choice for a peach. It also means that your food choices do not reflect your character or morality. Period. Throw out the preconceived notion that any foods are “good” or “bad”. No one food has the power to make you fat or slim. Eat what you want. And i mean What you really want. Do not compensate for something you ate or force yourself to earn your food. You need to eat no matter what, and making deals with yourself will not move you towards a peaceful food and body relationship. 1. Pay attention to the foods that are appealing to you and make a list of them. 2. Put a check mark by the foods you actually do eat, and then circle the remaining foods that you’ve been restricting. 3. Give yourself permission to eat one of the forbidden foods from your list, and then go buy this food or order it at a restaurant. 4. While you eat it, check in with yourself to see if the food tastes as good as you imagined. If you really like it, continue to give yourself permission to buy or order it. 5. Assure that you keep enough of this food in your kitchen so that you know it will be available if you want it. Or, go to a restaurant and order the particular food as often as you’d like. Once you’ve conquered making peace with one food from your list, continue onto the next until all of the foods are tried, evaluated, and freed. If you list is really long, which is very possible, you may get to a point where you don’t have to experience the “proof” by eating. As long as you continue the process until you truly know you can eat whatever you want, it’s done its job. Food does not have to control you. It shouldn’t control you. We cannot give it power in our lives that it was never meant to have. The most effective way to prove to yourself that you’re allowed to eat whatever you want, even the foods you’ve deemed “bad”, is to experience eating those very foods. They have no magic hold on you or your willpower. It’s time to end the food fight, and I would love to assist you on your Intuitive Eating journey. Send me a message today, and stay tuned for principle #4! Simply stated, this means eating when you’re hungry, every time. But how come that can be so complicated? Are there times you’ve felt hunger but didn’t eat? Hunger is a normal, biological process. Hunger cues are a biological signal that we cannot ignore. Trying to override these feelings or honor them unsatisfactorily will ultimately lead to overeating, strong cravings, and being unable to trust your body. Dieting leaves you feeling deprived and hungry, and your ability to perceive moderate portion sizes and to truly be conscious of what you’re eating dissolves when you reach the point of extreme hungry. Learning to honor your hunger will allow you to establish self-trust. However, so many of us have dishonored our bodies’ cues and implemented external food rules that have caused us to lose touch with what hunger really feels like. Society tries to convince us that we need to control our hunger and is always promoting a new way to “overcome” it. Hunger is not a matter of willpower, it’s pure biology. If you’re hungry, you just need to eat. 1. Recognize YOUR hunger cues. Give yourself permission to eat exactly what your body wants in that moment. By doing this, you build body trust and are able to move on with the day, putting your focus on the things it should be on. By teaching yourself that you can eat what you want, when you want, you’ll repair your relationship with food and rebuild trust with your body. Meal plans that try to dictate what and when you eat are not helpful, but especially if you’re somebody with a busy schedule, having meals or snacks ready to grab-and-go is important. It’s smart to have something on hand at all times, even if it’s just little energy bites (like these!). You can make some big-batch meals and store them in the freezer for when you need a quick dinner. This eliminates the excuse of “not having food” from being a reason to not eat. Keeping FUN foods in your house is important too, because they are not off limits, and sometimes you’re going to crave ice cream, potato chips, or a chocolate chip cookie. That’s normal. That’s allowed. That’s okay. If that’s what you want, eat it. …of honoring your hunger stands on being able to trust your body and your body being able to trust you. Constant denial of hunger cues regularly tells your body to store the food you eat for the next time you’re hungry or deprived, rather than using it as fuel like our bodies are supposed to. The best way to “rev up your metabolism”, like the media is always talking about, is really just to eat: consistently, adequately, and satisfactorily. This is how your body will find its natural, healthy size, too. Focus on YOUR internal cues and not on anything that is trying to externally dictate your food or eating. Your hunger is unique to you, and it won’t be the same from day to day. If you’ve completely lost touch with what your hunger feels like, begin eating on a consistent schedule: you could try 3 meals and 2 snacks everyday, each about 3 hours apart. You want to try and eat balanced meals with a variety of foods and without long periods of time between meals. Learning to honor your hunger is another part of the intuitive eating journey. Like I’ve said, this is not an easy journey. The freedom, joy, and acceptance that it brings, though, is more than worth it. Stay tuned for principle #3! Now that you’ve got an idea of what Intuitive Eating encompasses (this post! ), it’s time to delve into the 10 principles that set its foundation. This first principle is a BIG one. It’s essential. It’s fundamental. It’s hard. What is the diet mentality? Well, it’s not only the extreme diets and “easy solutions” we constantly hear about in the media. It’s that little nagging voice of “small, sustainable changes that should help me lose weight” too. Because when something goes wrong (i.e., somebody doesn’t lose weight like they had been hoping to), the message or idea that this person is doing something wrong or not trying hard enough is more detrimental than the fact that they didn’t lose weight. Think about it: If you’ve ever tried to diet, how did it make you feel? Were you tired? Did you have cravings? What has a focus on weight loss done to your body and mind? Dieting is a setup for failure. It is the problem, not the solution. Denying the signals your body sends you naturally on a daily basis causes unreliable hunger and fullness cues and breaks the trust between your mind and your body. Dieting erodes confidence and self-trust. It teaches your body to retain more fat once you do begin eating normally again and slows your metabolism down for the next time it’s forced into “starvation mode”. It increases cravings and often leads to food binges, and dieting is highly associated with eating disorders. Ultimately, dieting leads to weight GAIN; only 2-5% of dieters sustain weight loss for greater than five years. 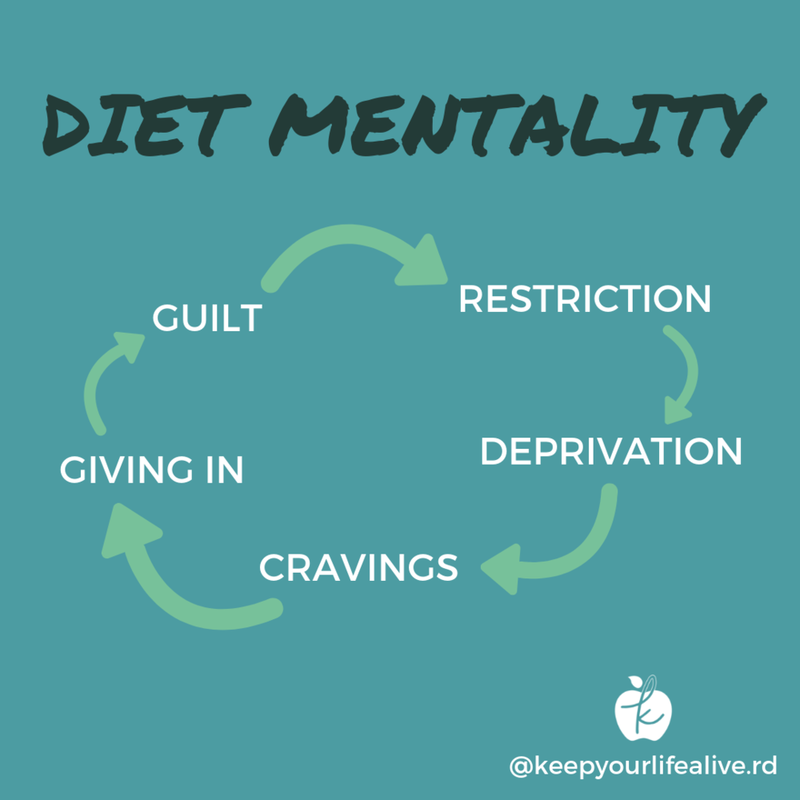 Dieting is a constant cycle of restriction, deprivation, cravings, giving in, feeling guilty, and starting again. Health does not equal thinness, but the diet culture in our society is obsessed with this idea. Our value is not placed on being a certain size, weight, or shape, and it’s time we start valuing the things that MATTER. So, what can you do to reject the diet mentality? 1. Acknowledge the negative effects that dieting or a diet mentality can have and the fact that dieting is dangerous. Aside from the effects I mentioned above, dieting can increase the risk of premature death and heart disease. 2. Observe how you think about food. Is it constantly on your mind? Do you have “good” and “bad” foods or see yourself as “good” or “bad” based on what you’ve eaten? Do you have rules about when, what, or how much you “should” eat? 3. Forget the ideas of willpower, obedience, and failure when it comes to eating. 4. Get rid of body scales, food scales, calorie counters, food trackers, and fitness apps. Anything that reduces your value down to a number—you do not need it to be healthy or feel good about yourself. 5. Throw out any diet books or magazine articles that promote weight loss techniques. Unfollow social media accounts that don’t make you feel good about yourself. Scrap any “meal plans” that attempt to dictate exactly what and how you should eat. Stop looking for a “new” diet so that you can rediscover intuitive eating and take a gentle approach to nutrition and your body. Your intuitive eating journey might be long, it might be hard, and it will probably be frustrating at times, but it will be worth it. This is a journey of constant progress and being kinder to yourself. A single food, meal, or even entire day is not going to make or break your health. Rejecting the diet mentality is rejecting the idea that weight or fat is something that you need to get rid of. It means recognizing that there isn’t one way of eating that’s “right” or “best”. Care for your body as it is right now, in this moment. Stay tuned for principle #2! Intuitive Eating… a term you might’ve heard. Lately, it’s gotten a lot of buzz, and there’s a big movement towards the philosophy. Although I am 110% on board, it’s a little bit disappointing that this movement is as shocking or as big of a deal as it is. We’re born as natural, intuitive eaters. A baby knows when he or she is hungry and full. They eat until they’re satisfied, and they simply eat what is provided. Nothing is seen as “good”, “bad”, “healthy”, “unhealthy”, or labeled any sort of way. Obviously up until a certain age, children cannot count or read the nutrition facts labels on foods. Calories don’t exist. However, even when they are able to see and comprehend these numbers, they don’t attach such significant meaning to them. Food is fun, pleasurable, and merely a part of life. We need it to survive, but it should not control our lives. Now that society is becoming aware of the fact that Intuitive Eating is essentially the healthiest way to live— no diets or restrictions, participating in joyful movement, reduced stress, satisfaction, and pleasurable eating experiences— the movement towards “non-dieting” has begun. Not everybody is going to buy into it, that’s just a part of life, but I hope that you will at least give it a chance. Intuitive eating means eating when you’re hungry and stopping when you’re full. It means eating the food you truly want, when you want it. It means moving your body in a way that FEELS good and makes you happy. It means not labeling foods as “good” or “bad”. It means no longer allowing food (or a lack thereof) to control your mind or your life. It means respecting your body enough to love it as it is, give it what and how much it wants, and not punishing it later. It means learning to resolve and honor your feelings without using food. This concept has become so much more difficult than it was ever meant to be. Instead of being encouraged to listen to and honor our bodies, we are bombarded with diets, rules, and restrictions about food. There are 10 principles to the philosophy of Intuitive Eating, and I’ll cover each one in more depth in separate blog posts. If you choose to embark on a journey of Intuitive Eating, the journey might be difficult. It WON’T be perfect. But what I can promise you is that the hard work and any temporary, uncomfortable feelings that might surface will absolutely be worth it. You’ll learn to listen to your body again, trust it, and be able to live your best life. I’d love to help you on this journey, too! Click HERE to read about the different levels of services I offer. There’s no time like the present to better yourself and develop an overwhelming sense of peace, confidence, and joy WITHOUT petty restrictions. You can read more on my Instagram page HERE as well, and I’d highly recommend THIS book if you’d like to learn more about intuitive eating!